Autumn nights have arrived in London and with it comes the need for puff pastry wrapped meats but as you all know…I’m a salmon addict. So yeah I do salmon Wellington. It is a warm hug on a cold fall evening and, as 99% of recipes on this blog, it’s easy peasy lemon squeezy. Melt the butter in a pan and cook your garlic and onion until soft and translucent. Add your spinach, mushrooms, salt and pepper and cook until spinach is wilted and mushroom is soft. Add in your cream cheese and stir until combined, then add the breadcrumbs, and the chopped herbs along with the Parmesan. Stir everything until its combined and set aside. On your clean work surface smooth out the puff pastry and place you salmon on one side of it. 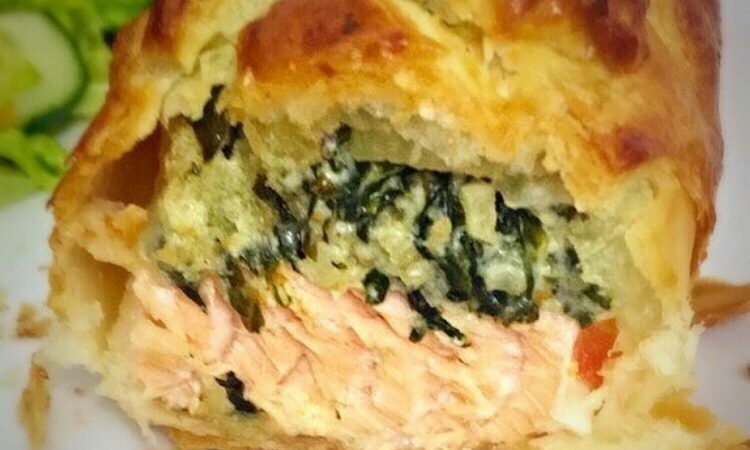 Spoon a few tablespoons of your cheese mixture on the salmon, then fold your pastry over it and trim the edges. Beat the egg and brush it on the top and edges of the pastry and score the top, then brush it again with the eggwash. Bake for 25 minutes until the top is golden, slice and enjoy.